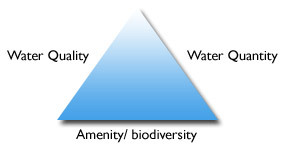 The SUDS triangle encourages us to take account of water quality, water quantity and amenity/biodiversity. as well as providing habitat and function for those using the area, including the local community and wildlife. The European Water Framework Directive requires us to manage water resources sustainably and to protect water quality. SuDS offer an integrated approach that could play a key part in delivering the Directive’s requirements.